This was the final class in this series of Susliving workshops at Thomastown Town of Food for this part of the Gardening & Horticulture course. 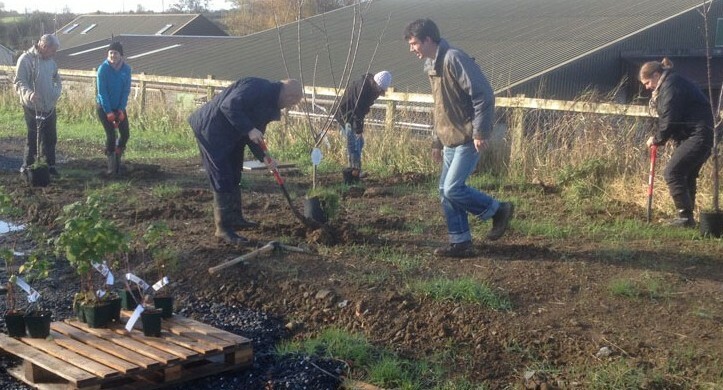 It was a good time to review what has been achieved since the autumn, turning a green field site into a working and ready-to-function kitchen garden. There was a great feeling of achievement by the participants for all the work carried out during the autumn and throughout this first workshop series. 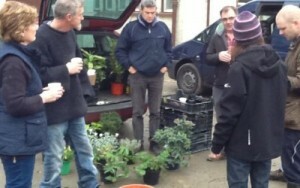 A clear, sunny New Year’s day got Susliving’s Tech Mentors and workshop participants off to a lively start in the Thomastown Town of Food garden. The garden is really taking shape with the main pathways now in place, allowing easy access to the different garden areas. Despite the difficult weather conditions endured during the autumn, the polytunnel is in it’s final position and is ready for use in the spring to make an early start in growing vegetables and fruit. Week 8 of the Susliving Gardening & Horticulture workshops was particularly frosty and bright. Being the last session of 2014 at Thomastown Town of Food however, gave it a festive feel. As did the mince pies and Santa hats! Another full session at Week 7 of the Thomastown Town of Food gardening workshops, carried out by Susliving Tech Mentors and members of the Thomastown community. This was a very interesting session lead by Susliving Mentors Gary and Zaki, constructing outdoor garden furniture from used pallets. This repurposing of waste timber, that is usually left around or thrown out, was a great reminder to us that we need to look at what’s around us to see if we can use ‘waste’ material as a resource. Week 6 of the Thomastown Town of Food Gardening & Horticulture workshops saw the completion of the poultry run, the hen house and the nesting box. These were done in kit form, so that each can be assembled when the ground conditions are suitable in the garden. It was very instructive for those attending the workshop to see what can be made from salvaged timber and used pallets! Each week there is a group discussion prompted by suggestions from participants. In this workshop we discussed ‘plants for shady places’ – identifying a range of plants that can grow successfully in areas of reduced light levels in the garden. Susliving horticulturalist Elmer Dool kicked off the week 5 Gardening & Horticulture workshop with the continuation of the construction of the hen run and hen house. Having discussed with all the participants the pros and cons of designing the hen run in several different ways, Susliving Tech Mentor Gary Dalton demonstrated the best and most economical way of using timber, to result in a strong, stable, practical poultry run. The Thomastown Town of Food Gardening & Horticulture workshops are led by Susliving’s resident horticulturalist Elmer Dool and cover a wide range of useful and practical topics including Garden Design & Planning, Rainwater Harvesting, Composting and Garden Fruit. Running in the Food Campus in Thomastown, these workshops are part of a series of ten in total and have been a great success. 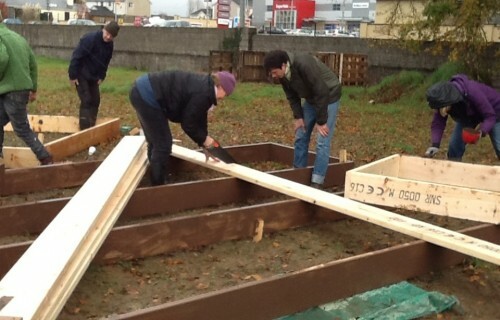 Despite some unfavourable weather conditions, the Gardening & Horticulture workshops have been a great source of learning and have also produced an initial set of constructed raised beds and compost bays which will be used in the Town of Food garden.